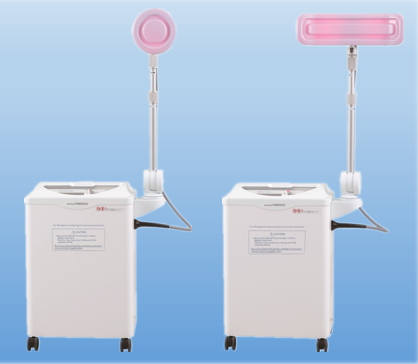 ●Standard Microwave Therapy Unit ●Two Types: 1-Channel Type & 2-Channel Type ●Various safety functions equipped. ●Simple start in two steps. 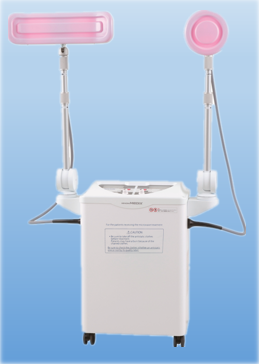 ●2 treatment sounds, 4 ending sounds ●The arms can be freely adjusted. 1. Set the treatment time by treatment time seting switch. 2. Turn up the output volume to start the treatment. 1. 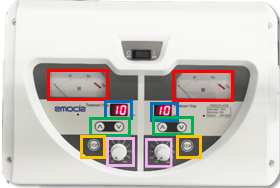 When the timer expires, the treatment is automatically finished. *Please press the stop button, if you want to finish during the treatment. When the output exceeds 35% of the rating, the output automatically shuts off. To prevent excessive irradiation, once the position is not returned to the zero position, the irradiation output cannot be adjusted. Even if the cooling fan of the magnetron breaks down, overheating is prevented by the thermostat. Even if the microwave from the irradiator is applied to the operation panel, it does not affect the circuit board.